This stunning and colourful plant that displays exotic and vibrant red torpedo-shaped inflorescences, rising above a sea of lush green foliage as if ready to be launched into space, is definitely an attention grabber and demands notice. 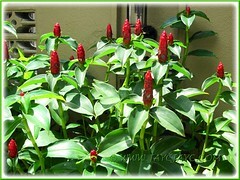 No wonder Costus woodsonii, is very much favoured as a decorative landscape and garden plant or container specimen. Like the Cheliocostus speciosus, another spectacular plant, it is becoming more and more popular in Malaysia in recent years. It is often planted at home gardens, recreational areas and parks, as well as in containers at entrances to hotels, restaurants and shopping malls. Red Button Ginger, named thus because of its lovely flower head that comes forth as a luscious red button, is one of the robust spiral gingers in the Costus family that has more than 100 species. It characteristically features leaves that are spirally arranged around the graceful and succulent stems. An easy growing perennial herb that is a prolific bloomer year-round in warmer regions, Costus woodsonii will certainly be excellent for any landscape design or just to fill garden space with its captivating form and long-lasting inflorescences. Etymology: Originally named Costus spiralis, the plant was renamed in 1972 by the Dutch botanist Paulus Johannes Maria Maas to honour Dr. Robert E. Woodson Jr. (1904-1963), who was the Curator of the Herbarium at the Missouri Botanical Garden and dedicated much of his life to the project of compiling the Flora of Panama. Origin: Native to Mesoamerica (Costa Rica, Nicaragua, Panama) and Colombia in South America. 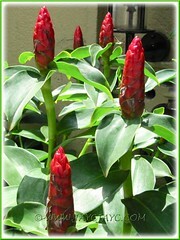 Features: The vigorous-growing Costus woodsonii, an attractive species of the genus, Costus, can reach 1.5-2 m in height and spread about 1 m wide. However, the cultivated plants are typically below 1 m in height, with a spread of 0.6 m, probably belonging to the dwarf cultivars, such as ‘Dwarf Lipstick’, ‘Red Button’ and ‘French Kiss’. It is a perennial and evergreen herb that sends out leafy cane-like stems from its underground rhizomes. Being rhizomatous, it forms a decent clump in no time and presents a dramatic cluster with elegant stems in various stages of growth and flowering. The broadly elliptical leaves (roughly up to 15cm long and 8 cm wide) with tapering tips are bright to dark green in colour, simple and entire, glossy and glabrous. As typical of spiral gingers, the leaves spiral around the thick green stems which are normally upright but may sometimes be leaning and gently spiraled, creating a dense appearance. 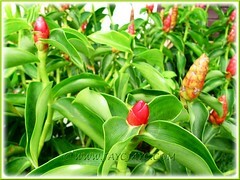 Red Button Ginger will flower profusely throughout the year in the tropics and other warmer regions. In fabulous contrast with the green foliage, lipstick-red inflorescences will appear at terminal stems. The flowering spike is made up of waxy red bracts, tightly overlapping like fish scales, to form an erect, cigar-shaped or torpedo-like flower head, 6-10 cm tall. The true reddish-orange flowers with inconspicuous orange-yellow labellum are edible and will peek out one at a time from between the red bracts, lasting for only a day per flower. Surprisingly, it’s not the flowers but the waxy red bracts on the conical inflorescence that will secrete the sweet sugary fluid from its extrafloral nectaries, attracting ants that come to harvest the nectar and help protect the seeds from being destroyed by larvae of certain flies. Fruits and seeds are sparingly developed. Occasionally, plantlets will emerge from the base of a withered inflorescence and take root when the stem tip touches the ground. 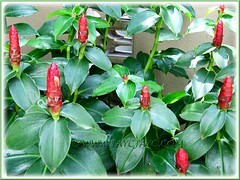 Culture (Care): The fuss-free Costus woodsonii grows easily with minimum care. Light: Prefers filtered light to full sun. However, it can tolerate part shade to full shade but flowers best in warm and sunny locations. Soil: Prefers moist, fertile or humus-enriched and well-drained soil. It is salt-tolerant and known to grow well near the beach. Others: Occasional misting is encouraged if the weather is too hot and dry. 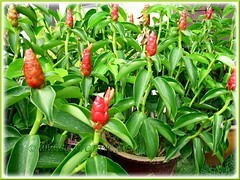 Costus woodsonii benefits from monthly feeding with a balanced liquid fertilizer during the growing season. Remove withered flower heads to maintain neatness or let them be if you want plantlets to develop to get more plants. You can also prune off the whole stem with its spent flower head and subdivide into a few cuttings for propagation. Generally it is pest and disease free. For subtropical and temperate regions: Hardiness: USDA Zone 9b-11. Grows well in tropical and subtropical climate. Cold tolerance down to 30°F (-1.1°C) with protection against frost. Though the plant can tolerate a light frost for short periods of time, it is advisable to mulch the roots heavily to protect plants from freezes or bring indoors to overwinter. Water and feed sparingly during the cold months and maintain temperatures above 50°F (10°C), otherwise it will not flower. Propagation: By rhizomes, division of clumps, plantlets, or stem cuttings. Plantlets that form around a withered inflorescence, can be severed and propagated as new plants. 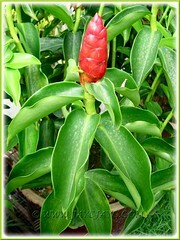 Check how-to propagate Costus woodsonii here, similar to methods applied for Cheilocostus speciosus. Usage: Grow Costus woodsonii to add beauty and charm in perennial beds and borders or as an exotic garden/landscape specimen. Its compact and small stature make it very ideal for container gardening or in raised planters to decorate homes, patios, decks, as well as entrances to hotels, shopping malls and other commercial buildings. Its eye-catching and long-lasting inflorescences will be splendid as cut flowers in floral arrangements and thus greatly valued in the floral industry. Gingers are among my favorites. 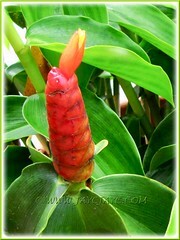 My next will be Zingiber zerumbet and then Costus, unless I find Costus first. Hi Nell Jean! Wish you all the best in procuring your favoured plants. Zingiber zerumbet has a lovely ring to its name… a pity that the lovely cones get hidden by the foliage, unlike the show-off Costus woodsonii. I have this plant and I really enjoy growing it. Very easy to propagate, hence save a lot of money. They do ‘light up’ my garden. Thanks for visit, Autumn Belle. We hope to get a couple of this vibrant beauty too to light up our garden! My ginger buttons comes out green or light red! I want the super red lipstick colors, how do I get it? I bought the plant about 3 months ago and divided it into 2 pots. One of the withered flower is growing a new plant! Should I cut away the whitered flower or leave it on the stem? Hope some kind person visiting here can assist you. We’ve just started growing our first plants early this month, so unable to give you positive answers. Sorry. Do I ever need to prune back my Red Button Ginger? Hi Julie. Yes. Whenever you noticed any spent flower head, just prune it off together with the whole stalk right down to ground level, otherwise it’ll appear unsightly. 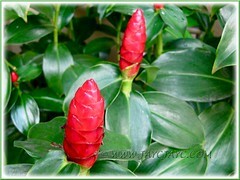 Where can I buy red button ginger flower in philippines? Sorry, we’re unable to help you as we’re residing in Kuala Lumpur, West Malaysia. How beautiful plant this are! I extremely happy to cultivate this plant. But i want to know details about the medicinal value of this plant. Indeed the plant is very beautiful with showy flowers. Sorry, I’m clueless about its medicinal value. You may want to google-search for the answer. I recently planted a red button ginger plant under my very large oak tree. My landscaper had to cut out a lot of the roots nearby to allow for a hole twice the size of the plant. It looked great for about a month. We’ve had several heavy rain, which I thought would be nice for it. It is covered with mulch after we mixed the soil with a slow release feeder. It is protected from direct sunlight and gets partial light at lease 3 hours a day. What I am seeing is the leaves are turning yellow in the inside and hope it is due to the recent cold spell (not frost) but was covered with a plant cover. Some of the top leaves has holes in them I believe from the falling oak leaves. Some of the red button looks like it is dying or burnt at the edges. Can anyone tell me what is happening to my plant?